This inflation bulb is for the Aircast Walkers - Styles SP, FP and XP. Will this bulb work with my Aircast PTTD brace? Thank you. Will this work on my aircastelite select boot? I have already returned one boot due to a failure of the air release button. Now, two weeks of wearing a replacment aircastelite select boot (replaced by DJglobal) the air release button has once again fallen apart. I am hoping that I would be able to just splice the tubing and bypass the orignal garbage pump, with this hand bulb. Please advise. Will this air bulb work on the Breg Shell Air boot CE is the only letters we can find on the boot? All aircast bulbs are Universal for the Walkers. Below find the link to purchase the Bulb Online or Call and Place the order via phone. My son accidentally threw out my bulb with the trash. Does this bulb both inflate and deflate? How long will it take to ship? Thanks! This bulb both inflates and deflates. Simply call 1-800-553-6016 to get it replaced, they can ship it as soon as overnight delivery. Will this work with the 01F-M walking brace? 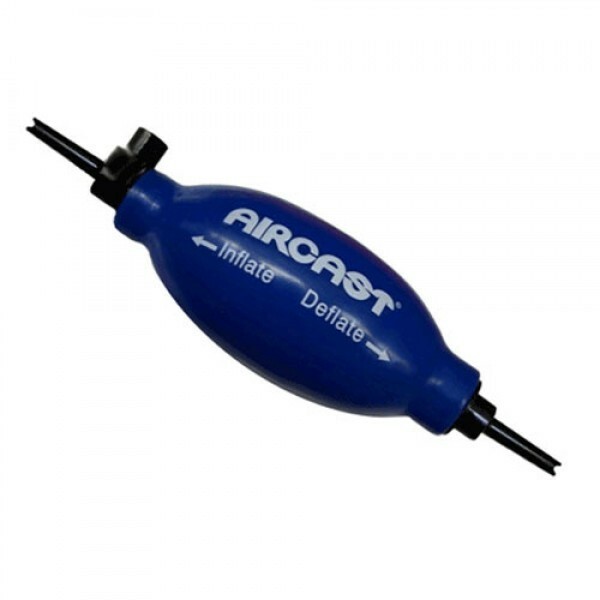 Will this Aircast Hand Bulb also work on my Aircast FP Foam Pneumatic walker? Will this work with the Aircast Ankle Stirrup ? The Aircast Air-Stirrup Ankle Brace has pre-inflated aircells. You cannot adjust the inflation. Will this work with the: XP Walker 01P-L? I've lost the hand bulb that I was using on my walking boot and this closely resembles that. Is this only as advertised; only for wrist and knee or can you use it on the walking boots as well? The Aircast Hand Bulb can be used with the Aircast Walking Braces. Cons: It would have been nice if it wouldn't have taken 2 weeks to ship it. I would hope they would think that if someone ordering this they either post the one they had prior or it was damaged and didn't work and therefore they are unable to use the product that the pump is used for. I received the bulb quickly, and it works perfectly. Pros: Fits in the boot.